What's the difference between Honda HR-V and Honda CR-V? Difference between Honda HR-V and Honda CR-V? Since it was introduced to the American market in 1997, the Honda CR-V has continually been one of the best-selling vehicles, much less SUV, as well as one of the most highly reviewed. To meet consumer demand for more features and more interior space the Honda CR-V has grown a bit in the passing years. The HR-V was introduced to cater to the demand for vehicles with the benefits of SUVs such as increased cargo room and higher visibility, but still feature the maneuverability, performance and fuel economy of a smaller car. Though there are similarities between the two models, they’re completely different SUVs targeting different types of buyers. 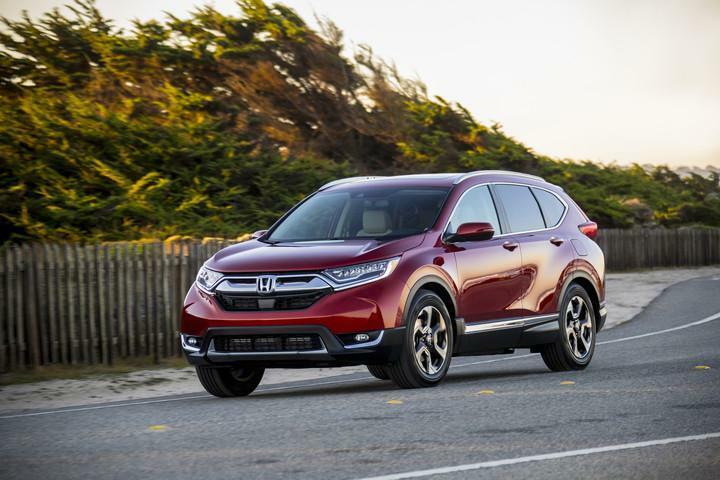 What follows is our Honda HR-V vs. CR-V comparison highlighting design, dimensions, drivetrain, infotainment and connectivity, safety, and fuel economy. The Honda HR-V carries very modern styling cues, like sharp headlights with a gloss black insert and a strip of chrome trim. Character lines carved into the side panels give the HR-V an aggressive crossover look. The CR-V features a much more contemporary design, aligned more with the tastes of the shopper of the traditional CR-V shopper. Inside the modernistic interior of the HR-V, every button, switch, and knob is placed right where you expect it to be. The driver faces a three-spoke steering wheel and an analog instrument cluster. The center stack houses the touchscreen that displays the infotainment system and the climate control panel. While offering the same level of ergonomics one expects from a Honda, the inside of the CR-V carries a cleaner, more traditional design than the HR-V. Some models even feature wood trim, definitely an indicator that the CR-V has moved upward since its launch. On the exterior the HR-V measures 169 inches from bumper to bumper, is 63.2 inches tall, and 69.8 inches wide. In comparison, the CR-V’s measurements check in at 180 inches long, 66.1 inches tall, and 73 inches wide, respectively. In regards to interior space, the HR-V offers a maximum interior space of 100.1 cubic feet with a maximum cargo space of 57.6 cubic feet with the second row of seats down. In contrast, the CR-V offer a maximum total passenger volume of 105.9 cubic feet, but with 75.8 cubic feet of cargo space with the rear seat down, almost 50% more than the HR-V.
Honda offers the HR-V its 1.8-liter, four-cylinder R19Z9 engine which is fuel injected, has an aluminum-alloy cylinder block and cylinder head with a SOHC 16-valve design and four valves per cylinder which utilizes Honda's i-VTEC system. The R19Z9 engine is rated at 141 horsepower and 127 pound-feet of torque. The lower two trim levels come standard with front-wheel drive and a six-speed manual transmission, while the range-topping model features a Continuously Variable Transmission (CVT). Available with the CVT is Honda’s Real Time AWD with Intelligent Control system. The standard Honda CR-V comes equipped with a 2.4L four-cylinder K24W engine that features i-VTEC technology, a DOHC valve train which utilizes roller rockers to reduce friction. The K24W produces 184 horsepower and 180 lb-ft. of torque. A second engine option is available in the CR-V and it incorporates much of the technology that Honda has developed over the years, creating a powerful but small, lightweight engine. The L15B7 VTEC Turbo is a DOHC in-line four-cylinder engine with VTC, single scroll MHI-TD03 turbo with internal wastegate, and direct fuel injection. Despite its diminutive displacement, the turbocharged CR-V engine develops 190 horsepower and 179 lb-ft of torque. The entry-level HR-V includes standard equipment that includes a four-speaker stereo, Bluetooth connectivity, and a five-inch color LCD screen. The midrange EX trim level adds a six-speaker sound system and a seven-inch touchscreen, while the range-topping model benefits from navigation and HD radio. Available upgrades include a six-speaker sound system, seven-inch touchscreen, and navigation. The top three trim levels of the CR-V are fitted standard Android Auto and Apple CarPlay compatibility, features now offered on the 2019 HR-V.
Every HR-V regardless of trim level comes standard with front, side, and side curtain airbags in addition to traction and stability control systems. The top two trim levels also feature a blind spot monitoring system. Likewise, the CR-V is also fitted with front, side, and side curtain airbags, plus traction and stability control systems. Buyers can order Honda Sensing, a suite of electronic driving aids that includes collision mitigation (which brakes when it detects a crash is imminent), road departure mitigation (which emits visual and audible warnings if it senses the car is veering off the road), adaptive cruise control with low-speed follow, and lane-keeping assist. For more information or to make the comparison yourself, come into Vardaman Honda and talk to our SUV experts. They’ll let you crawl through both the CR-V and HR-V and then send you out on a test drive! Were certain you will find the Honda SUV that best meets your needs.